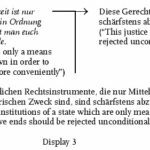 Argumentation implies reasoning, and an important aspect of this process involves processes of reorganization of the adressee’s representation. The same processes of reorganization happen in the course of problem solving, a traditional topic of research in cognitive psychology. Traditionally, in the study of problem solving processes, with or without interaction between partners, the reorganization of the subject’s representation was drawn from impasses, viz from the situation where the AI system simulating the problem failed. The system was considered to set the right representation when the resolution was optimal, and to shift into the wrong representation when the strategy moved aside from the optimal one. More recent researches in this area try to focus on the study of the reorganisation of the representation and to elaborate criteria for a more refined approach of its definition, in terms of pauses, backtracks, illegal moves, constraints (Richard, 1982, 1993), or in terms of adjustments to the external world through preliminary simulations of the planning, for example SOAR (Rosenbloom & al., 1991), case based planning (Hammond, 1989). Let us notice some more deepened studies focus on particular steps of the strategy (Allport, 1989; Welsh, 1991; Begoin-Augereau, 2002). Some other studies focused on the analysis of concurrent verbal reports following Newell & Simon (1972) and Ericsson and Simon’s model (Ericsson & Simon, 1979, 1984), which had the peculiarity to link the linguistic form to the content of the memory of attentional processes (Short Term Memory). In spite of Nisbett & Wilson’s criticisms (Nisbett & Wilson, 1977) and without falling into the trap of introspection, they demonstrated that thinking aloud verbalizations during a problem solving task have to be considered as a coding of the information available in short term memory. In this line Vanlehn (1991) showed that the reorganization of the representation is not linked only to impasses, and that several linguistic marks, notably interjections, point to reorganizations of the subject’s representation, according to the insights of the Gestalt approach (Ohlsson, 1984a, 1984b ; Simon, 1987). Some approaches in the line of Situated Action (Clancey, 1991) suggest that language plays a mediating role in the actualisation of internal representations through the situation and that internal, external and actual representations cannot be reduced to a representational flatland. The subject is interacting not only with others but also with external and physical objects. The external representation does not fit to the external world, but has to be internally constructed before being deposited into environment. These two last approaches suggest that the study of the reorganization of the representation is linked to the elaboration of linguistic criteria enabling to cut the verbal protocol into episodes and to yield a structuration of these. Current research (Caron-Pargue &Caron, 1989; Caron-Pargue & Fièvre, 1996; Bégoin-Augereau & Caron-Pargue, 2001) improved Ericsson & Simon’s minimal model and considered not merely the content of verbalizations but their linguistic forms as marks of the cognitive operations by which utterances and representations are constructed and processed in working memory. In this view the hierarchical organization of episodes can be interpreted as the hierarchical organization of chunks in working memory. But whereas behavioral criteria give only a partial vision of the solving process, a more refined approach of the reorganizations in the subject’s representation based on Culioli’s enunciative model (Culioli, 1990, 1995, 1999) may be achieved through a study of the linguistic markers in the subject’s verbalizations. It leads to characterize elementary actions as well as aggregates and emergent objects at the different levels, internal or external, of the process of construction of the actual representation (Bégoin-Augereau & Caron-Pargue, 2001, 2002). 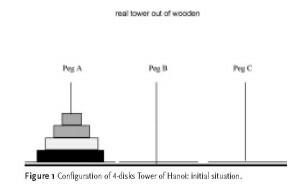 Our purpose in this paper is to formulate some linguistic criteria for cutting protocols into episodes, to interpret them cognitively, and to show the existence of a hierarchical organization of these criteria, in the case of a well known problem solving task, the problem of the tower of Hanoi solved by 7, 10 and 14 years olds during four successive trials. On the basis of linguistic markers, cuts into episodes will lead to a demarcation of the units of cognitive processing ; the links and boundaries between utterances will define the elementary actions made by the subject . Furthermore the acquisition of expertise through age and successive trials gives rise to the construction of automatizations and simplification of representations and to a transfer of processing from internal to external problem space both defined from linguistic criteria (Bégoin-Augereau & Caron-Pargue, loc. cit.). Our hypothesis relies on the assumption that differences through age and expertise in the repartition of criteria for cutting into episodes evolve according to the acquisition of automatizations and to the simplification of initial representations. Therefore a hierarchical structuration of these criteria can be established and matched to the underlying organization and structuration of chunks in working memory. Every subject has in front of him a wooden board to which are fixed three vertical pegs aligned from right to left (A, B and C; cf. fig 1). Four discs of decreasing size and different colours are stacked on the peg A: pink for disc 1, the smallest one; green for disc 2; yellow for disc 3; black for disc 4, the biggest one. The goal is to carry all the discs from peg A to peg C, under the following two constraints: only one disc must be moved at a time, and a disc may not be placed on top of another smaller than itself. The subjects have to keep on with their research until the problem is completely solved. They are asked to think aloud, that is to say, they have to tell aloud whatever they think during the solving process. Subjects: Three groups of 20 novice participants each (French speaking subjects) respectively 7, 10 and 14 year-olds. Every subject resolved the problem of the tower of Hanoi during four consecutive trials. So we obtained a total of 240 verbal protocols. The examples presented below are translated in English with the original verbalization put into parentheses. As much as possible the translation was done in order to preserve the different linguistic cues from which cuts into episodes were done. Three complete verbal protocols will be presented here after with the current state of the problem coded as follows. For example (3)(4)(12) means: that disk 3, the yellow one, stands on peg A; that disk 4 stands on peg B; and that the two last disks, disk one and disk two, the pink one and the green one, stand on peg C.
 the green one it is the green one on the A (le vert c’est le vert sur le A). – Interjections: Interjections have to be considered as traces of storing or recovering knowledge in memory (Caron-Pargue & Caron, 1995, 2000). They occur always in case of an insight, viz a reorganization, which bears either on the content of knowledge itself or on the contextual constraints which characterize the access to this knowledge. The subject focuses and recognizes some contextual features or compares a current state with an expected situation or a purpose. In fact most of the time interjections won’t mark a cut of episodes because they mark the surprise of the participant while an integration of new and old informations occurs and when the reorganisation of representation will work just later. Nevertheless some linguistic marks such as well, why, wait (bon, ben, attends) and some contextual cases of yes (oui) point either to an aperture or a closure of the text (Caron-Pargue & Auriac, 1997, Caron-Pargue & Caron, 2000). In this special case interjections demarcate episodes in a similar way as connectives themselves, but as the same time with a control of the selected information in short term memory, that is to say that the units other than the unit introduced by the interjection would be temporary inhibited and refocused later. Such a treatment allows to concentrate cognitive efforts on a critical step, as in example . – Change locator, Change located, Double locator, Double located: The terms ‘locator’ and located’ are referring to the basic enunciative operation of location (repérage) in Culioli’s linguistic model. It means that a lexis – more commonly known as a proposition – composed of two elements x, y and a predicative relation R, constitutes an oriented relation xRy from x to y, and therefore involves an operation of location, with the located element y relative to the locator x. When a change in the naming of locator or located element or as well a double naming of them occurs, it introduces a double point of view on the considered element of the situation by referring it to two different concepts (Caron-Pargue, in press). So it introduces a reorganisation of the representation. A change in the naming of the located element occurs in example  where the C points to the fact that the disk is moved from peg C to another peg, while precedent namings referred to the color of the disks. In  a similar change of naming occurs this time for the locator with the green disk which points to the peg where the disk has to go by mentioning a disk which is already on that peg. In  the two different namings avec le deux and sur le C point to two different points of view on the same peg. – Others. In this category are gathered the criteria which are not very representative of cutting into episodes for the collected data. These criteria concern the appearance or disappearance of a term modifying the structure of the sentence such as changes of verbs, of grammatical subjects, of prepositions. For example the preposition on (sur) can be replaced by with (avec). These criteria are interacting with other criteria and some more work is needed in order to study them. Moreover pauses equal to or higher than 20 seconds are also gathered in this category because they cannot be studied properly with the data collected for this research. Each linguistic mark defined above will constitute a criterion for cutting verbal protocols into episodes. Three examples are presented in Table 1. It can be noticed that the various cuts appear right before the appearance of the criterion except in the case of the connective and (et) which points to the last utterance having to be integrated at this level of representation and for which the cut stands right after this integration as the cut between lines (8) and (9) in example b. In the very simple example a (cf. Table 1a), cuts on the right were done before line (16) for the criterion of change in the naming of locator, viz of the peg. Cuts on the left were done before lines (10), (26), (39) and (41) for change in the naming of located element, viz of the disk. Cuts before lines (16), (27), (29) were done because of connectives. Finally one can notice the presence of two criteria connective and change in the naming of locator before line (16). This example is very interesting because it compels us to take into consideration some kinds of cuts such as change of naming, if not there would be almost no halt during all the problem solving, and even no cut at all in some protocols. In example b (cf. 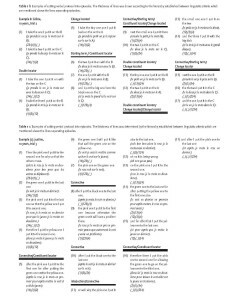 Table 1b), beyond the two precedent criteria, one can find cuts with Double locator before line (3), with Starting terms before lines (6), (9), and (15), and with Constituent locators in their more or less complex form before (6), (11) and (13). Let us notice that in (11) and (13) the Constituent locators are also composed of starting terms, because of the anaphora, but could not be taken into consideration because of the preceding utterances which are both composed of starting terms. In this case the presence of a starting term cannot point to a change of representation. A similar case will arise each time as a specific criterion will be repeated in the following utterance. Finally this protocol shows a cut with four criteria before (9) which corresponds at the level of the problem solving to the achievement of the main step ‘move the biggest disk to the goal peg’. The interest of example c lies first in the difference between the two kinds of connectives, with demarcation of units for some of them, before lines (5), (8), (10), (16), whereas others are integrated in (1), (3), (5), (9), (14), (15), (16) with so that, for after, because, for. Furthermore another interest lies in the fact that in (4) the connective therefore cannot introduce a new unit because of the repetition of the naming of the disk the yellow one already present in the preceding utterance (3). Such a repetition introduced a linguistic link between the two utterances. Finally this protocol shows a case of cut with interjection before (11). We now intend to show the psychological relevance of the linguistic criteria used in the division into episodes. The results concern the number of episodes established according to the various linguistic criteria defined above, as a function of age and of the acquisition of the expertise through the successive trials. First, we made a survey of all the cuts for a given criterion, namely the number of times when each of the criteria gave rise to a cut within the protocol. In a second time, we made a survey of all the cuts for more than one criterion, namely when each of the criteria appeared in conjunction with another criterion. The dependent variable was the total number of times that a specific criterion was accompanied by other criteria for all protocols for a specific age or a specific trial. For each protocol this number was computed as follows. For example the criterion Connective appears 2 times as one single criterion in protocols a and c and 0 time in protocol b (see Table 1). As more than one criterion it appears 1 time in protocol a, 2 times in protocol b and 3 times in protocol c. Therefore the number associated to Connectives for the three protocols presented in table 1 was 4 for one criterion and 6 in case of more than one criterion. Nevertheless in case of more than one criterion, the number of uses of the criteria Change of naming and Double naming is low and moreover these two criteria appear very often together in both cases located and locator. It leads us to consider in this case only two criteria located and locator without differentiating Change of naming and Double naming. 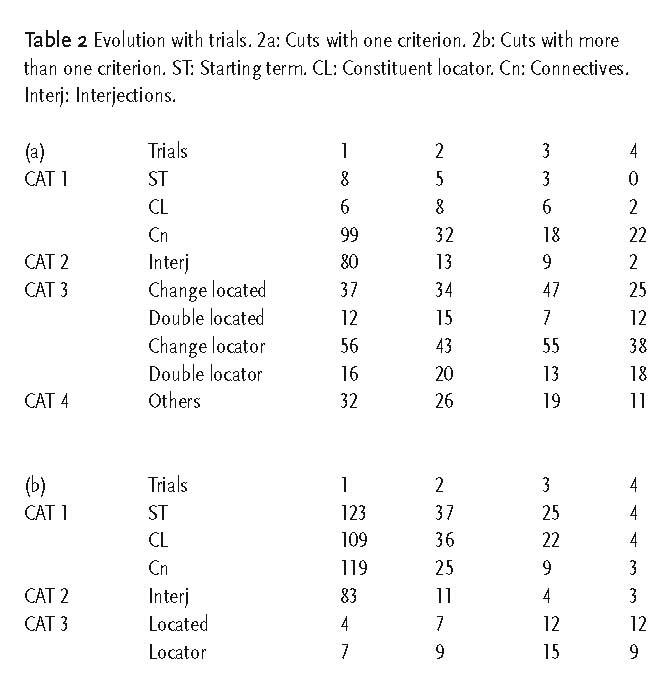 The data concerning the evolution with trials are presented in table 2. As well for one criterion as for more than one criterion, the difference between Starting term and Constituent locator, and between the four kinds of criteria where the located and locator elements were concerned are not significant. Therefore after a regroupment of these criteria, a significant improvement with the acquisition of expertise can be shown both for one criterion (Khi ² = 127.4, d.f. = 12, p < .0001), and for more than one criterion (Khi ² = 174.1, d.f. = 9, p < .0001). Table 2: Evolution with trials. 2a: Cuts with one criterion. 2b: Cuts with more than one criterion. ST: Starting term. CL: Constituent locator. Cn: Connectives. Interj : Interjections. – the total number of single cuts, more important for the criteria Change or Double locator or located than for other criteria, remains constant in the course of the trials. Nevertheless the total number of Change of naming and of Double naming independently of the located or locator element differs significantly during trial 3 as the number of Change of naming increases while the number of Double naming decreases. 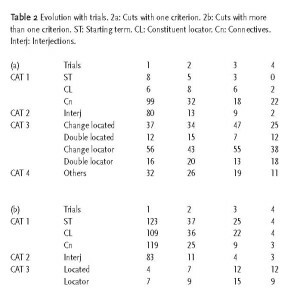 Concerning Connectives, their number is always high, particularly on trial 1, but begins to decrease from trial 2, whereas the number of Starting terms and Constituent locators is consistently low across the trials (Khi ² = 12.05, d.f. = 3, p < .01). As for Interjections, if their number evolves in parallel with connectives, it decreases much faster from trial 2 on (Khi ² = 13.95, d.f. = 3, p < .01). Finally the criteria Others decrease regularly with trials. – the number of cuts for more than one criterion decreases gradually with trials for Starting terms, Constituent Locator, Connectives and Interjections, nevertheless the two last criteria Connectives and Interjections decrease faster from trial 2 than Starting terms and Constituent locator (Khi ² = 18.1, d.f. = 3, p < .001). The data concerning the evolution with age are presented in table 3. The difference between the number of Starting terms and Constituent locator did not differ significantly as well for one criterion or more than one criterion. But two differences arise between one criterion and more than one criterion. First whereas Connectives did not differ from the two precedent criteria but differ from Interjections for the case one criterion (Khi ² = 6.76, d.f. = 2, p < .05), with an higher but later increase of its number for the 14 year-olds, it is the reverse for the case more than one criterion: whereas Connectives did not differ significantly from Interjections, their total number increased with age while the total number of Starting terms and Constituent locator decreased (Khi ² = 6.95, d.f. = 2, p < .05). A second difference stood in the fact that a significant difference was shown between Located and Locator criteria with Change of naming or Double naming for more than one criteria, with an increase of Locator for the 14 year-olds, while no significant difference appear for one criterion. Table 3: Evolution with age. 3a: Cuts with one criterion. 3b: Cuts with more than one criterion. ST: Starting term. CL: Constituent locator. Cn: Connectives. Interj : Interjections. – for one criterion, between: a) Starting terms, Constituent locator, Connectives, b) Interjections, c) Located or Locator elements and Others (Khi ² = 56.943, ddl = 6, p < .0001). While the number of Starting terms, Constituent locator, Connectives and Interjections increase with some little differences between them, the total number of Located and Locator element shows a sudden and very high maximum for the 10 year-olds and then tends to decrease for the 14 year-olds. Furthermore the number of criteria Others decreases suddenly for the 10 year-olds. – for more than one criterion, between: a) Starting terms, Constituent locators, b) Connectives, Interjections, c) Located, d) Locator (Khi ² = 19.9, d.f. = 6, p < .005). In this case, the total number of Starting terms and Constituent locators shows a minimum for the 10 year olds and tends to increase again for the 14 year-olds. 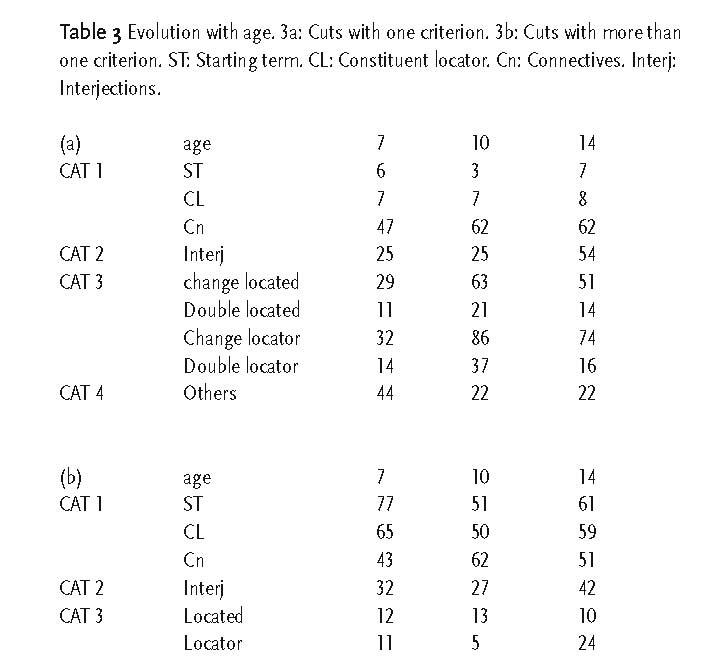 The total number of Connectives and Interjections increases with age, while the number of Located and Locator elements remains constant except for a sudden increase for the 14 year-olds in the case of the Locator. In summary, the number of cuts into episodes done with Connectives for both cases (one single criterion and more than one criterion) is higher at the beginning of the learning at every age, then it decreases gradually in the course of the acquisition of expertise. The cuts with Starting terms and Constituent locator in case of more than one criterion appear especially with the youngest participants and at the beginning of the learning and then their number decreases. The number of cuts with Interjection increases with age, but decreases with the acquisition of expertise for one or more than one criterion. The cuts with Located or Locator characterize especially the cuts with one single criterion in a constant manner through the acquisition of expertise and show a sudden increase for the 10 years olds. The Others criteria appear especially at the beginning of the learning, for the youngest participants and in the case of one single criterion. Several differences appeared according to age, acquisition of expertise, and the context of use. We have now to draw out regularities at the level of the linguistic criteria. A first remark is that the number of occurrences of each linguistic criterion does not increase with expertise. If some of them, Connectives or Interjections increase with age, it concerns the beginning of the learning process. Therefore this fact does not contradict our working assumption according to which the task representation had to become less and less complex as the expertise increases. The fact that the total number of Change of naming or Double naming for the Located and Locator elements is rather constant through the learning process and that most of them appears in isolation, leads us to consider these criteria as characterising the simplest and automatic representations constructed through expertise. Other linguistic criteria such as Starting terms, Constituent locators, Connectives, Interjections gradually decrease in number with the acquisition of expertise. But this decrease shows two distinct speeds, with the higher speed for the Interjections and the lower one for the other criteria. Another argument re-inforce a little more the need of making a differentiation between these last kinds of criteria. Indeed the differences of use as single criterion or with other criteria allow to assign them a more or less complex role in the construction and successive reorganizations of the task representation. It is the same for the differences observed in the progression of the number of Connectives and of Interjections through age. We can now link these results to previous data concerning the progressive structuration and simplification of the representation in a problem solving task (Begoin-Augereau & Caron-Pargue, 2001, in press; Bégoin-Augereau, 2002). This representation appears as the result of a true interaction between the subject and the physical environment. The criteria which allowed to differentiate an external space from an internal one were as follow. The external space was identified from the absence of starting term, itself recognizable from the absence of anaphora. An intermediary space through which the interaction is carried out occurs when starting terms appear, even if there is no link between them. The linguistic definition of a starting term considers it as a distinguished element, and the interpretation on the cognitive level was to consider it as pointing to the cognitive operation of selection of information. 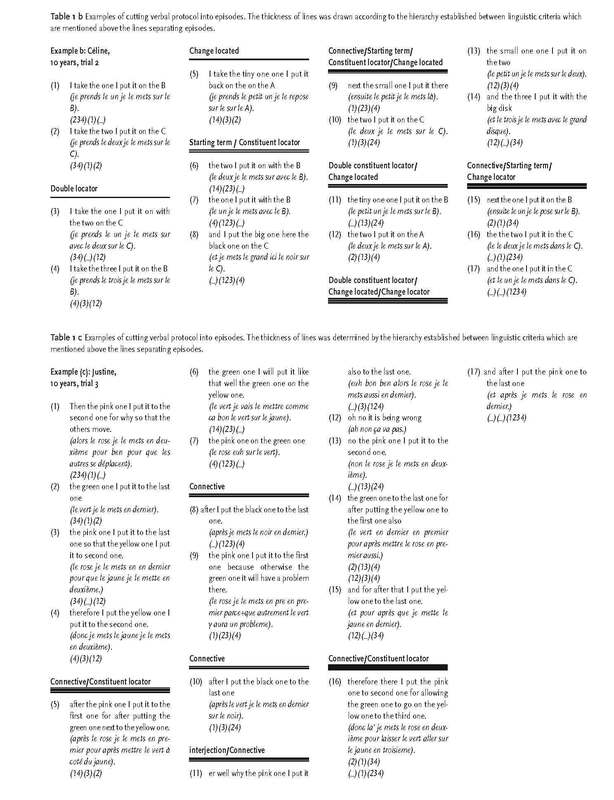 Furthermore direct or indirect links can be established between starting terms: direct ones as for example with the connective so that (see Table 1c, line 3) with a link establish around the verb; indirect with for example the repetition of the naming with the C (see Table 1b, lines 6-7) which marks a link based on the preposition. Direct links between starting terms construct the internal space from the physical environment. Indirect links between starting terms work through the intermediary space either to construct the internal one or to progressively simplify and reduce it to an external space non reducible to the physical environment. Then the criteria established for cutting a protocol into episodes can be situated through these cognitive processes of constructing and reorganizing the representation. The basic cuts corresponding to a maximal reorganization correspond to the case where multiple criteria coexist in order to demarcate a main unit. Starting terms and Constituent locators play a major role in these operations specific of the internal space. Local cuts arise in the external space with Changes of naming and Double namings. And the reorganization of the representation is still more basic when these two sorts of cuts coincide. Interjections as a kind of modal markers play a specific role in these constructions. They point to a disengagement of the current representation in order to establish links through the parts, embedded in a more or less complex fashion, of the representation. So the corresponding cuts correspond to intermediary steps. Connectives can work at different levels according to the current structuration, internal or external, of the representation. In Table 1, these different levels of hierarchy were marked with the more or less thickness of the lines separating the episodes. 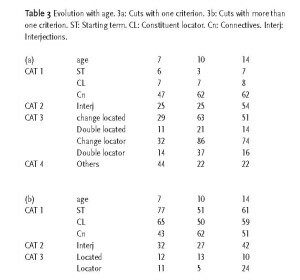 Thus in Table 1c, two main cuts done with the conjonction of the two criterion Connectives and Constituent locator point to three separate representations of the problem among which the more complex and the more hierarchically organised is the middle one. In Table 1b, a single main cut occurs just before line (9), and corresponds to the achievement of a main subgoal of the problem. 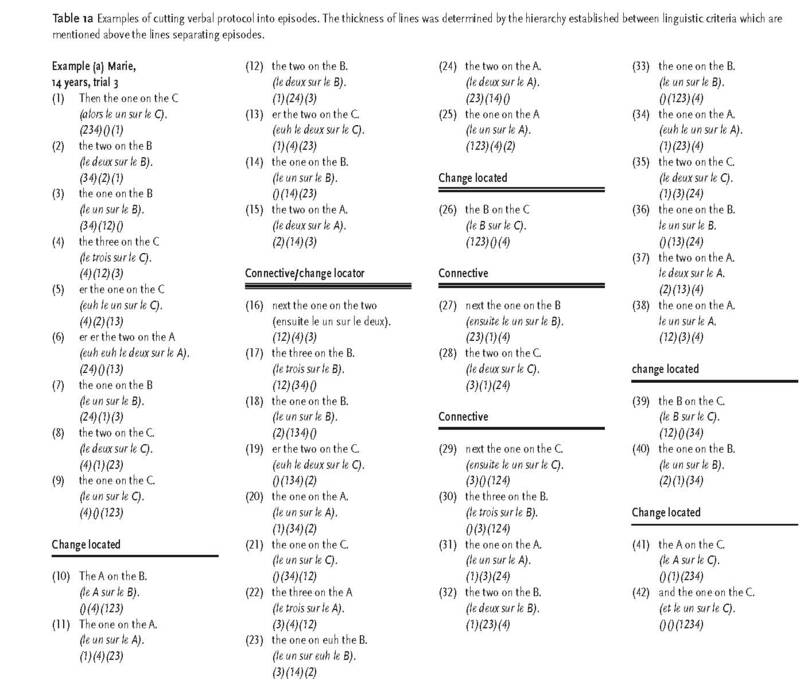 In Table 1a, still a single basic cut, before line (16), belonging to the external space, leads to consider this step as a state of the problem space where the subject is controlling her / his strategy by the anticipation of an adjustment occurring in the next episode, from line (16) to line (25) without another cut. – Category 3 is composed of Change of naming and Double naming of the element located or locator which are either chosen or not in the organization of the predicative relation. If the context of these cuts is an external space composed with an internal one, the corresponding reorganizations are very local ones, just automatically controlling the internal processes. But if the context is only an external space, these cuts point to the external steps and implicit constraints automatically controlling the working of automatic procedures (see Caron-Pargue, in press). Surely a lot of work has still to be done in order to clarify these results as well in the area of problem solving, as in the study of interactive processes, a study which has just been tangentially prepared with a temporary restriction of these processes to the interaction with the physical world. Beyond the problem of cutting a protocol into episodes which can be extended to argumentative ones, the more interesting connections lie in the demarcation and the construction of automatic links, susceptible to conduct reasoning. Allport A. (1989). Visual Attention. In M.I.Posner (Ed.) Foundations of cognitive science. Cambridge MA: MIT Press. Bégoin-Augereau S. (2002). Effets des labels verbaux dans la résolution d’un problème : approche énonciative. Doctoral dissertation, University of Poitiers. Bégoin-Augereau S., Caron-Pargue J. (in press). Effets de la dénomination d’un objet caractérisés à partir des verbalisations dans la structuration post-visuelle d’une situation problème. Visio 7(3). N° Special ‘Le visuel à l’ère du post-visuel’. Caron-Pargue J. (in press). Structuration post-visuelle d’une situation problème sémiotisée à travers les verbalisations simultanées à la résolution de la tâche. Visio 7(3). N° Special ‘Le visuel à l’ère du post-visuel’. Caron-Pargue J., Auriac E. (1997). Etude psycholinguistique de la marque conversationnelle “bon” dans une interaction cognitive. In J. Bernicot, J. Caron-Pargue et A. Trognon (Eds): Conversation, interaction et fonctionnement cognitif. Nancy: P.U.N. Caron-Pargue J., Caron J. (1987). Towards a psycholinguistic approach of argumentative operators : the “thinking aloud” procedure. In : F.H.Van Eemeren, R.Grootendorst, J.A.Blair & C.A.Willard (Eds. ), Argumentation, Perspectives and Approaches, Dordrecht: Foris Publications, 170-178. Caron-Pargue J., Caron J. (1989). Processus psycholinguistiques et analyse des verbalisations dans une tâche cognitive. Archives de Psychologie, 57, 3-32. Caron-Pargue J., Caron J. (1991). Psychopragmatics vs sociopragmatics : The function of pragmatic markers in thinking aloud protocols. In J.Verschueren (Ed. ), Pragmatics at issue (Selected papers from the 1987 International Pragmatics Conference, Part 1). Amsterdam: J.Benjamins, Vol.1, 29-36. Caron-Pargue J., Caron J. (1995). La fonction cognitive des interjections. Faits de Langues. No special sur L’exclamation, 6, 111-120. Caron-Pargue J., Caron J. (2000). Les interjections comme marqueurs du fonctionnement cognitif. Cahiers de Praxématique, 34, 51-76. Caron-Pargue J., Fièvre M.D. (1996). Psycholinguistic analysis of a 10-years-old’s verbal protocol. Antwerp Papers in linguistic, 85, 45-74. Culioli A. (1982). Rôle des représentations métalinguistiques en syntaxe. Tokyo. In : Culioli (1999a): 95-114. Culioli A. (1990). Pour une linguistique de l’énonciation. I. Opérations et représentations. Paris: Ophrys. Culioli A. (1995). Cognition and Representation in Linguistic Theory. Amsterdam: Benjamins. Culioli A. (1999a). Pour une linguistique de l’énonciation. II. Formalisation et opérations de repérage. Paris: Ophrys. Culioli A.(1999b). Pour une linguistique de l’énonciation. III. Domaine notionnel. Paris: Ophrys. Ericsson K.A., Simon H.A. (1979). Verbal reports as data. Psychological ReviewI, 87, 215-251. Ericsson K.A., Simon H.A. (1984) Protocol analysis. Cambridge, MA : M.I.T.Press. Newell A., Simon H.A. (1972). Human problem solving. Englewood Cliffs, NJ : Prentice Hall. Nisbett R. E., Wilson T. E. (1977) : Telling More Than We Can Know : Verbal Reports on Mental Processes. Psychological Review. 84, 231-259. Ohlsson S. (1984a) . Restructuring revisited. I. Summary and critique of the Gestalt theory of problem solving. Scandinavian Journal of Psychology, 25, 65-78. Ohlsson S. (1984b) . Restructuring revisited. II. An information processing theory of restructuring and insight. Scandinavian Journal of Psychology, 25, 117-129. Richard J-F. (1982). Planification et organisation des actions dans la résolution du problème de la tour de Hanoï par des enfants de 7 ans. L’année Psychologique ,82, 307-336. Richard J.F, Poitrenaud S., Tijus C (1993). Problem Solving restructuration : Elimination of implicit constraints. Cognitive Science, 17, 497-529. Van Lehn K. (1991). 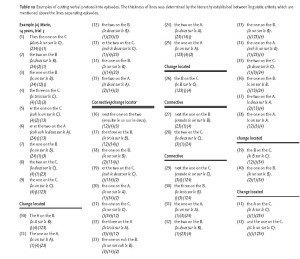 Rule acquisition events in the discovery of problem-solving strategies. Cognitive Science, 15, 7-47. Welsh M.C. (1991). 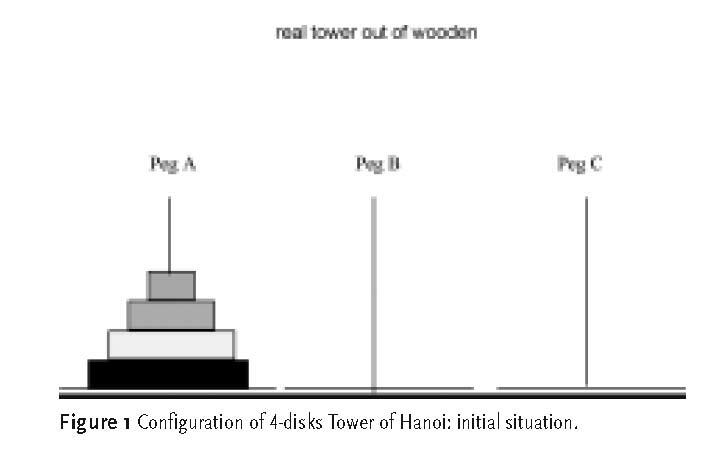 Rule-Guided Behavior and Self-Monitoring on the Tower of Hanoï Disk-Transfer Task. Cognitive Development, 6, 59-76.